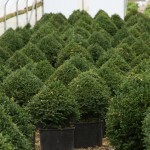 A dense shrub with small, dark green foliage that becomes bronze in cold weather. Forms a wide, oval pyramid. 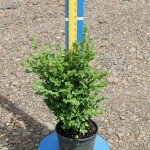 Excellent for use as a low hedge or foundation planting. Grow in full sun to part shade in an evenly moist, well-drained soil. Prune if needed for form. Introduced in 1975 by Sheridan Nurseries.